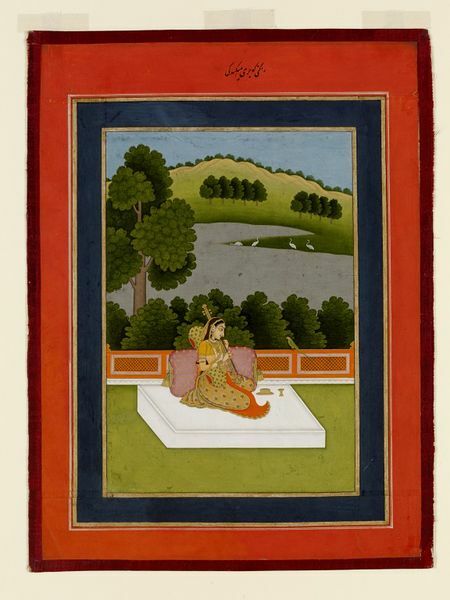 This is an illustration to the musical mode Gujari Ragini, represented here as a young lady playing a vina, a plucked instrument. The mood is one of yearning, and the parrot may be seen as a symbol of her absent lover. This painting was formerly owned by Sir Elijah Impey, Chief Justice of the Supreme Court of Calcutta from 1774 to 1783 and a renowned collector of paintings. 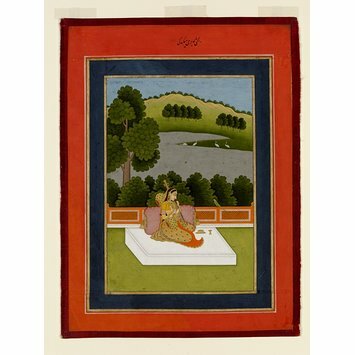 Painting, in opaque watercolour on paper, this scene depicts a young woman playing a vina (stringed instrument) on a waterside terrace, watched by a parakeet, as she awaits her lover. Illustration to the musical mode gujari ragini. IS. 71 to 73-1954 were purchased for £30 from Maggs Bros. The painting is in the style of the Mughal provincial court painting in Bengal.